You’re driving home from a friend’s house, when all of a sudden, you hear a loud and unflattering pop from your beloved tire. The car reaper has claimed another innocent tire! Don’t panic, changing a flat tire is very simple. Here is a play-by-play analysis of how to change your flat by yourself. The first thing you want to do is to pop open your trunk and get out that spare, tire iron and jack. Raise the car with the jack until the flat tire is completely raised off the ground. Once this is done, remove the wheel lugs completely. Once you jack your car up a few feet, it’s time to get a little dirty! Don’t worry, you’ll be OK. Use the tire iron to carefully remove each oiled lug nut from the wheel. Next, you want to position the spare tire over the wheel studs. This is the most physically demanding part of the whole process. You’ll have to hold up the tire and try to line up the holes in the wheel with the protruding wheel studs located on the brake hub. You should have no problems removing the damaged tire. Once the spare tire is on, carefully lower the jack and pull the jack away from the vehicle. The final step is to tighten down the lugs completely. That’s it. Now was that really that difficult? Don’t Rely On That Dummy! With the dummy installed, you should be able to reach your house or the nearest service station. You can’t keep driving on that dummy tire, as it can eventually break down on you, and if that happens, you’ll be flat out of luck! Always make sure that each tire of yours has the right amount of air capacity in it. You can refill each tire at your local service station. Changing a flat tire is a simple thing that can just require you to get a bit sweaty and dirty. There are some situations where you just need that pro to come along and give you a hand. 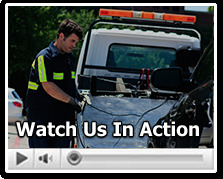 At Fort Worth Towing, we are there for you 24/7 in case of serious emergencies at night. You really don’t want to take any chances changing a flat on a busy highway at night. Let our friendly towing service guys help get you to your destination safely. We’re on call 24/7 and will arrive at the scene to help in really fast response time. So, next time you get that flat at night, give us a call.